Confirmation of your Safari will only be formalised upon receipt of a 50% deposit of the total daily rate. The balance may be paid on the day of your arrival or prior to your arrival. All other fees (Trophies, Government levies, CITES, Gratuities, Transfers etc) must be made in cash or travelers cheques prior to your departure from camp. No personal cheques will be accepted. National Parks Authorities require that all payments are made within 30 days of completion of your safari. This will ultimately circumvent any delays in the shipping of your trophies as well. 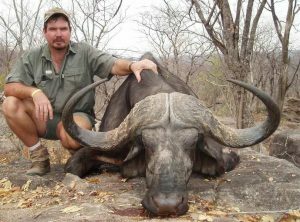 The hunting industry is a dangerous sport and as such it is paramount that all clients must comply with instructions given to them by the Professional Hunter whilst on safari. NYAMAZANA SAFARIS Pvt Ltd will not accept any responsibility whatsoever for any injury, loss, illness or expense arising from any such mishap incurred in the course of the safari. Nyamazana Safaris is fully insured in compliance with Government requirements (Public Liability). Clients are advised to take out the necessary insurance to cover the possibility of any accident or loss.